The third figure in the progression is Bruce Jenner, the fourth Caitlin Jenner. 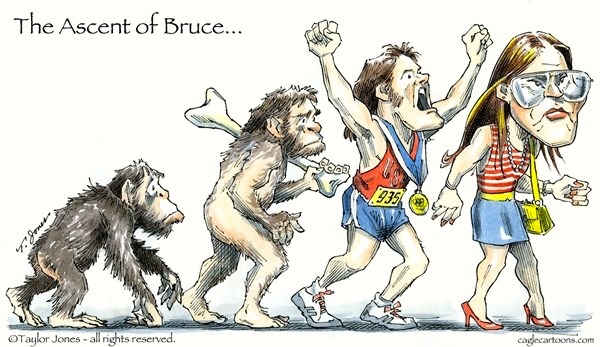 Some words about Caitlin Jenner, and then a few on the Ascent of Man cartoon meme. Caitlyn Marie Jenner (born October 28, 1949), formerly known as Bruce Jenner, is an American television personality and retired Olympic gold medal-winning decathlete. Since 2007, she has been appearing on E!’s reality television program Keeping Up with the Kardashians and is currently starring in the reality TV show I Am Cait, which focuses on her gender transition. Jenner was a college football player for the Graceland Yellowjackets before incurring a knee injury requiring surgery. Coach L. D. Weldon, who had coached Olympic decathlete Jack Parker, convinced Jenner to try the decathlon. After intense training, Jenner won the 1976 Olympics decathlon title at the Montreal Summer Olympics (after a Soviet athlete had won the title in 1972) during the Cold War, gaining fame as “an all-American hero”. Jenner set a third successive world record while winning the Olympics. The winner of the Olympic decathlon is traditionally given the unofficial title of “world’s greatest athlete.” With that stature, Jenner subsequently established a career in television, film, authoring, as a Playgirl cover model, auto racing and business. On the Ascent cartoon meme, see my 12/15/15 posting on “The evolution of nostalgia”, with 4 Ascent cartoons, an inventory of earlier ones on this blog, and a reference to Juli G. Pausas’s wonderful site on the evolution of man “Hypotheses on human evolution”, which has many many cartoons on the subject (86 at the moment, without the one above). This entry was posted on January 21, 2016 at 2:29 am and is filed under Cartoon conventions, Evolution, Gender and sexuality, Language and sports, Linguistics in the comics, Movies and television. You can follow any responses to this entry through the RSS 2.0 feed. You can leave a response, or trackback from your own site. I thought that Bruce was such a hottie in his day. But, often very good-looking people fall victim, like Narcissus, to their own beauty. This is NOT to say that therein lies the cause for his transgender propensity, but perhaps the celebrity and fame that came with explains his going to dark Kardashian side.